I love monochromatic looks, especially when they consist of the color black. There is something about wearing an all black look that is sophisticated, chic, a little edgy, and utterly slimming. However, if you're not careful, draping yourself in head to toe black can look a little drab (we don't want to look like we just stepped out of a funeral home), so today I'm sharing some tips on how to pull of the look while still looking stylish. 1. Add texture. Mixing different fabrics and materials together will add contrast to your look, which will break up the black and make it more interesting. Pair a silk blouse with a fur vest, or a lace top with denim, as I did here. I finished my look with a faux leather drape jacket giving it even more texture. 2. Choose pieces that have fun details. Studs, zippers, and buttons, all add an interesting touch to an all black look. I love how the zipper detail on my jeans break up the monochromatic color, while the studs on my heels add a fun touch. 3. Add a pop of color. 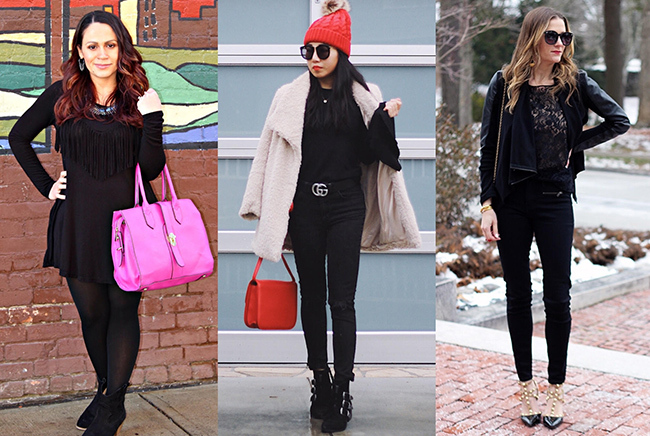 You can never go wrong by wearing a colorful bag or accessory with an all black look. I love how a red bag pops against the black, and my ultimate accessory is a bright lip. Today on the Weekend Wear Link up Melissa, Sheree, and I are sharing all black outfits, so make sure to visit their blogs and see their take on the monochromatic look. The feature blogger of the week is Lee from LegalLee Blonde. If you're looking for professional, yet stylish work attire, then you'll want to check out her blog, and I'm loving her December roundup! This is a great monochromatic look and great tips for how to make it work. I was drawn initially to the zipper on the pants, the studs on the shoes and then I noticed the purse! Beautiful bag. I love the texture mix of feminine and edgy! You look gorgeous! So chic, lady! Love a good all-black outfit! You totally rock this monochromatic look! And you tips are all amazing, especially the one to add a little texture and maybe one pop of color! Your Valentino dupes are a favorite of mine! I love a totally black outfit! And the lace top is fabulous! Love this all black look with your pop of red! Gorgeous lace top too! So pretty! Love the lace top and the pop of red with the bag! Playing with texture is key to wearing one color! You've mastered it for sure! I do love a little texture added to an outfit and what a great idea for a monochromatic all black look! Those gold heels look amazing with this look! Great tips for styling all black, and of course you nailed it here! Wow, love your take of the all black look! The lace detail is gorgeous and those shoes are so amazing! The pop of red goes so well with it, too! Thanks for hosting and hope you have a great weekend! I love this look. The lace and the edginess of the jacket play so well together. I love those heels too! The studs on the heels just adds to the edginess. Thank you for the linkup and have a great weekend. Love this black look and tips! I totally agree adding different textures and a pop of color can brighten it up. You are looking fabulous! I love the lace top! And the bag is the perfect pop of color! Thanks for the link up & Happy Sunday! Perfect look, so stylish :) thanks for sharing! I love your blazer! super chic look!